The distinctive coat of your golden retriever, or Labrador retriever, is extremely beautiful. Whether it’s a golden retriever puppy or a fully-grown adult, the light color and smooth and flowing hair on the coat make this breed one of the most unique and appealing ones in the world. Even so, you will have to take care of your golden retriever’s coat regularly. You will have to comb its coat often so hair will not be stuck and matting will never be a problem, which is something that is common with many dogs. This is also to help improve things when your dog is shedding. More importantly, this also keeps your furry friend’s coat from becoming too dirty. It is often very easy for a golden retriever’s coat to become dirty from all that running outdoors. Regular combing with a brush is a necessity for keeping your dog’s coat healthy and clean. There are numerous brushes that you can use when taking care of the Labrador retriever hair. These are made in many styles and can work well for keeping your dog’s coat looking great. This first choice is a pin brush that offers a comfortable grip. It has rubber-coated pin heads that are spaced well apart from one another. 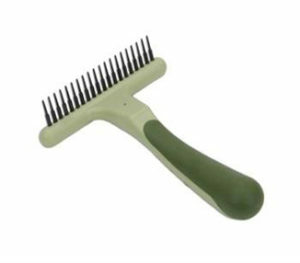 This offers a greater amount of control over how you comb your dog’s coat. The rubber pin heads can move deep into the coat to massage your dog. This in turn helps to stimulate blood flow and to allow oils to move through your dog’s coat with ease. This should keep your dogs feeling comfortable and relaxed during each brushing session. The pins are also small enough to get through many spots around your dog’s coat but are flexible and strong enough to where they will not break apart. This is a model that comes with two halves. 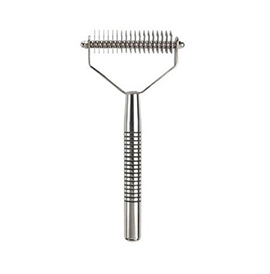 The first is a pin comb that features a series of rounded pins attached to nylon bristles. 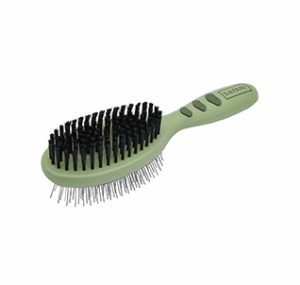 The second entails a brush comb arrangement where the nylon bristles are a little closer to one another but are still cut evenly and are flexible enough to keep from irritating your dog’s coat. Golden retriever hair looks beautiful, but can be a nightmare if not taken care of. That’s why the durable design of this particular dog brush comb ensures that your dog will be treated well when combed right. The silica handle on the comb also provides you with a comfortable handle that will not slip out of your hand while you are using it. This next choice is a slicker brush that uses a self-cleaning design. This features a small button on the back of the head. This moves the base of the brush up and covers the bristles, thus allowing you to clear out any old bits of hair that you get on the dog brush. 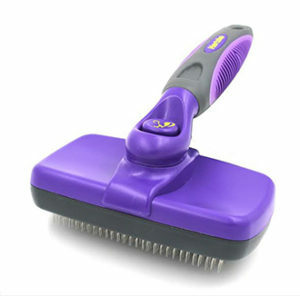 It simplifies the overall cleaning process and keeps you from struggling with lots of hair clumps on your brush. The bristles feature fine bent wires that will get onto the undercoat and groom it properly to remove loose hair without stretching your pet’s skin. This creates a comfortable look that is easy to handle without irritating your dog in the process. 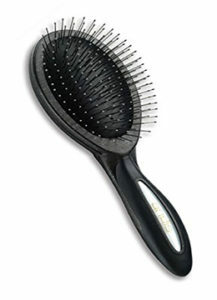 This is another attractive brush that has a great two-sided body. Available in medium and large sizes, this is made with a comfortable design that is easy to handle. It uses a soft grip that features a few rubber bases that keep your hand from losing its grip. It uses a pin brush arrangement on one half and a bristle brush layout on the other to remove all loose hair. When looking to get rid of some of the deeper matting and snags in your furry friend’s coat, you should look for a quality dog rake. This option from Coastal Pet uses a non-slip grip with a soft handle that is curved to fit well in your hand. The pins on this rake are large and still rounded. This will not pull too heavily on your dog’s coat. This allows the hair to stay comfortable without suffering from more stress or pressure than needed. It is a comfortable model that will not irritate your dog when it is used the right way. You can always work with this Oster rake for your dog’s needs. This targets the undercoat in particular and moves deep into that area without much effort. It removes dead undercoat areas without requiring you to cut anything. This is perfect for not only removing dead hair and mats but also for shaping and thinning out the coat. This in turn makes it easier for the coat to grow and flow in the future. This also comes with a comfortable grip that has a series of small grooves in the middle. This allows for a nice hold that will not slip out of your hand. The metal body of the grip is not overly cold or harsh either. Always use your brush in long strokes in the direction of the hair growth. Be sure you clean off your brush in between uses and even while using it. A dirty brush won’t get through your dog’s coat as well as it should. Your dog’s coat doesn’t have to be wet for you to use a brush although it might help simply to soften up some of the snags you want to get out. Never be too rough on your dog when using a brush. 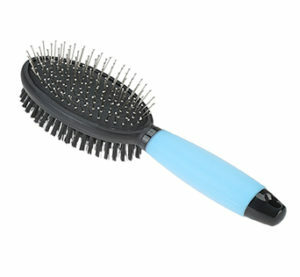 The bristles on a typical brush should be comfortable on your dog’s coat without being rough. Check the quality of any kind of brush you are using before you start taking care of your dog’s coat. The goal is to ensure that you are not being overly rough on your dog’s coat. 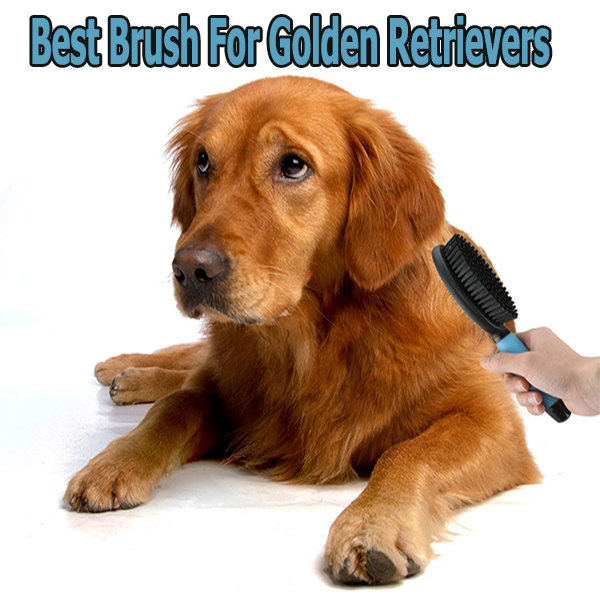 Be certain when finding the best brush for golden retrievers that you look at these options. They are all great choices that will provide you with a great grip that is easy to handle while ensuring that your dog is treated properly and with enough care.